I bought a yamaha attitude 4 string. Its an m series (cheapo) so its not the billy Sheehan set up. Difference ... dimarzios, hipshot, one chanel, scalloped fretboard etc. It is that grotesque turquoise color ... and that's gotta go. I am gonna incorporate some of billys's concepts into this bass. Ittl have stereo but it will also have mono switching. Ittl have a kahler, not a hipshot. Im open for more suggestions for what to do with this bass ... I have no idea what color to do it. I'll post pics when I got a minute. The washburn b2 is conning along looking awesome! By a Hipshot, do you mean it has a Hipshot trem, or a Hipshot extender key? As far as colors go, my suggestion will always be black! No ... it has no trem. Like I said ... base model. Im gonna put one on. like i said, attitude M series. (M? ... mediocre, mundane, marginal???) theres not much at all to this bass brand new. its a friggin HUGE thing and it weighs a ton. just a straight forward plain bass. i'de much rather have this than a standard fender p tho. it has no trem ... just a crappy fender base model chrome plate bridge. it has no hipshot detuner ... just bent up rickedy old gotoh 20:1's. it has no dimarzio ... just a stock yamaha split humbucker. it has no pearloid pickguard ... just the flat white. it has a very small passive electronics pocket and its under the wood ... the real LTD attitude has a stereo 1/4 outputs where this thing has holes for pots and the pots on the attitude are under the pickguard and this thing is solid under there. - kahler trem or a hipshot detuner ... billy states he wouldn't be without a detuner. i'm sorta impartial to them. i wont put a hipshot trem on it. i don't like em and i dont feel like doing all the extra routing to install one. - scallop frets? i've always wanted to. - color of course. eric got his two cents in. 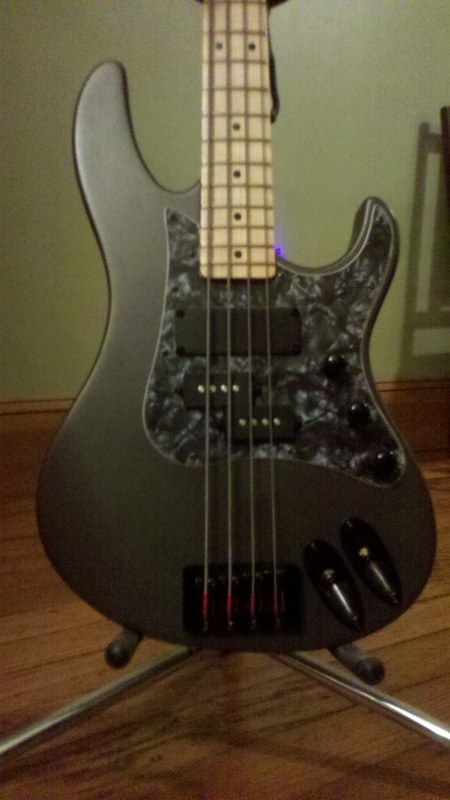 i am definitely gonna go with all black hardware and a black pearloid pickguard. i just think i can do so much more than just black finish. the washburn with the transitional color came out decent. its blue to purple. blue to black would work. black to red. black to orange ... ooooh. gimmie some more ideas here guys. - definitely gonna have the dimarzio model one. theres been talk about wiring this up with a split p and there being a tone issue or level cut when trying to blend the two pickups in mono mode. i'm thinking of doing an "if then or" setup with a preamp on a EMG split humbucker and the model one its own channel. i'm spending the day stripping the turquoise off it ... its got like 30 layers of lacquer and 20 of paint. paint stripper, paint stripper, paint stripper, paint stripper, paint stripper, paint stripper, paint stripper, paint stripper. scrape, scrape, scrape, scrape, scrape, scrape, scrape, scrape. Great idea mike. That looks killer! I've always liked those basses too. Ritter ... right? 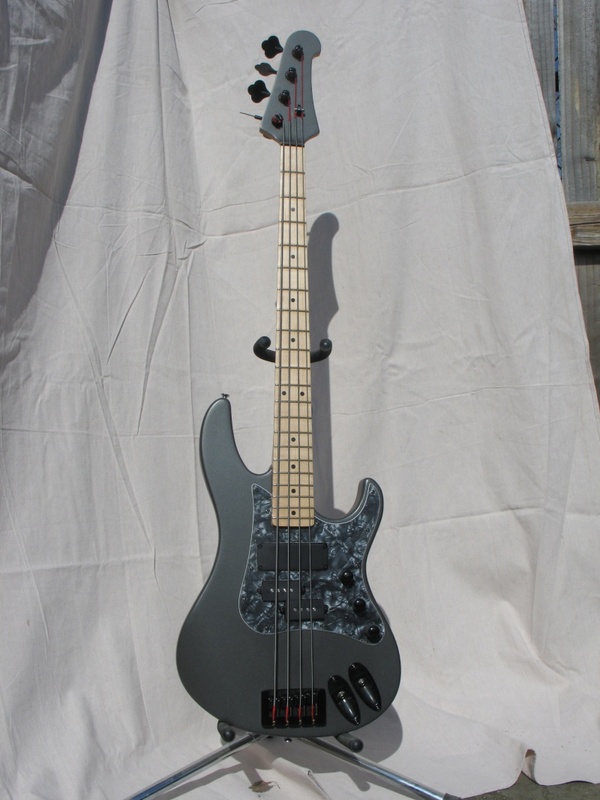 I don't think on this bass tho, as I'm trying to stick with the billy Sheehan attitude bass theme ... so I can sell it ... and buy the next one. Next one will be black and an all out steelers bass. That Ritter bass is off the hook! BTW, that purple P of Billy's is the only one he owns with a trem that I know of. He re-strung it with piccolo strings, and I haven't seen him play it for a really long time. 1. I always have my output jacks on the top instead of the side because the cords make a nice stop for my tremolo arm. I once had a bass with the jacks on the side, and I had to look down to find the bloody trem arm since it would spin and flop out of position. With it always resting on the cords, I can reach for it without looking down. Granted, this might not be a big deal to you. And of course, if you decide not to put on a Kahler, this wouldn't be an issue. 2. You Guys already know that I will always choose a trem over a detuner. And to be honest, since my tuning is what it is now, I have all of the low notes I will ever need. 3. I've never tried scalloped frets, but I do hear they make bends a lot easier and more dramatic. But I've also heard tales of scalloped frets aggravating carpal tunnel syndrome. I don't honestly know if this is true or not, just what I've heard. I can't even see why this would be true. 4. Granted, black is a very basic choice, and I am certain you could come up with something more dramatic and artsy for the bass. I once did a Van Halen striping on my old Tokai Jazz, and it was killer! I still think about doing it again! Model P: 163mv, 11.54k ohms. Perhaps the problem in blending comes from the P having a lower output, which means that the Model One will dominate the mix. But they aren't terribly far off, so maybe what you heard was from mixing a Model One with another type of P with an even lower output. My advice would be to find a P that matches the Model one's specs as closely as possible, so they would be on equal footing. Again, just more of my two-cents. yep a Ritter, but that black with a hint of yellow is so much cooler than my black on red lavacrackle!!! but that small amount of yellow on black ---steelers or not that is ME! As much as it pains me to say this, you Guys have a lot to be proud of with your Steelers. They have been phenomenal this season! We got lucky with the Seahawks making it into the playoffs, but we are all nervous about next Saturday's match-up with the Saints. And as I expected, my old Bay Area familiars the Raiders and the Niners did about as well as I thought they would. I had an Ibanez Ergodyne with a Kahler trem and hipshot detuner. Huge headache!!! 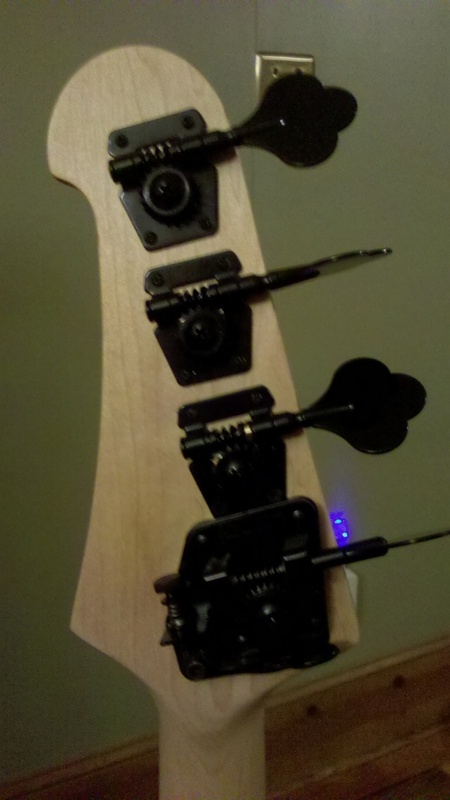 Because the Kahler "floats" due to string tension, the entire tuning goes out of whack when you flick the detuner. The tension decreases on the E string to go down to D, but your Kahler now moves back slightly due to that decreased tension and now the remaining strings are tighter and a higher pitch while your E is lower. takes about 5 minutes to remember the fret positions have changed but I also use an EADG tuned bass most of the time for songs that sound better with an open E or A,D,G. Spot on, Bro. This seems to be an issue with most players I have spoken to that have tried using both a detuner and a Kahler. I just play in drop d for everything. An ergodyne was my first kahler install project. Luthite ... yuk. Yes ... major headache. I had a un-played 10th anniversary Attitude, but sold it. If it were the purple one I would still own it. I bought it for $850 & sold it for $1200. Hmm... I was thinking a dark shade of purple. (Deep purple ... smoke on the water). Again ... this is an m series that im gonna hot rod to resemble a LTD, so it will not be a collectors item and will be meant to be played. With a kahler and all the electroncs and other hardware that's gonna be involved, I hope ittl balance out the neck dive. 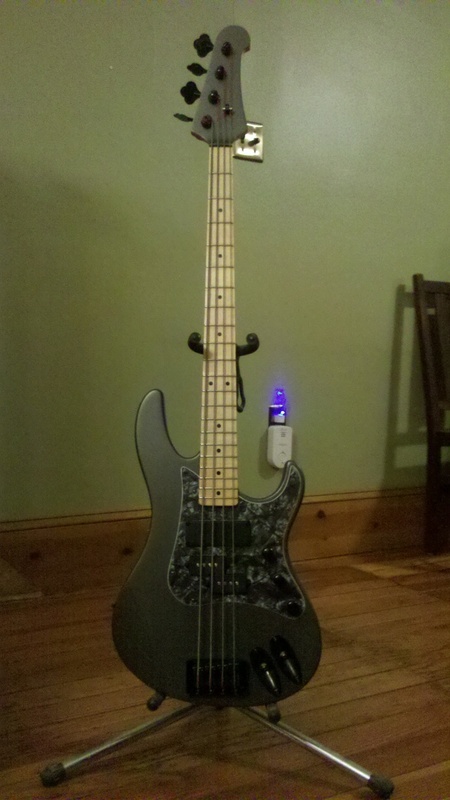 I got this bass in two prices so I don't yet know what the balance is like. I almost have this thing nekid. Hey yamaha ... thanx for the 1/8th inch of finish on this thing! hey BD, ok call me stupid but whats under the cover above the p-pickup...? Its either a dimarzio will power neck or model one pickup. I think the basses with the pick guard matching pick up cover were the model one's. The ones with the will powers were just the black pickup. I believe it was a model one. You could blend the woody Model 1 with the P to get that growly woofy tone he gets. I can get the same tone from my EB-0 project bass as its really the same set up, except for the duel output. It's also more fun to play (short scale) & the upper registers of the neck sound better. So ... I finally got this bass naked and ruff sanded. Paint in the pockets was a pain. I got some basic parts in; neck plate and screws and machine heads. Since I got this in prices, I decided to put it together to see if its even worth ordering all the parts, fixing all the dents and dings, doing the routing and painting it. This thing was so out of whack. Strings buzzed on frets with really high action ... yuk. About 3 hours of setup TLC ... now I understand why billy plays one of these and hot rodded it. the setup is different ... a lot of room! Action is really fast. Yes ... this is gonna make a good refurb. took it back apart again and taking measurements to start work. i thought thered be plenty of room ... overall this bass is huge. i mean, i could make it work, but this bass isnt for me. if i'm gonna sell it, its gotta be cosmetically decent and thus marketable. i cant have the kahler hangin 1/8" off the back at the top. i never installed one and i've played a few hipshot trems in the past. they never felt like they were secure or stable; rickety, wobely and not a smooth range of motion ... but then again ... i dont know who installed them. i think i might be able to do a better job. plus side ..... hipshots are generally cheaper than kahlers. 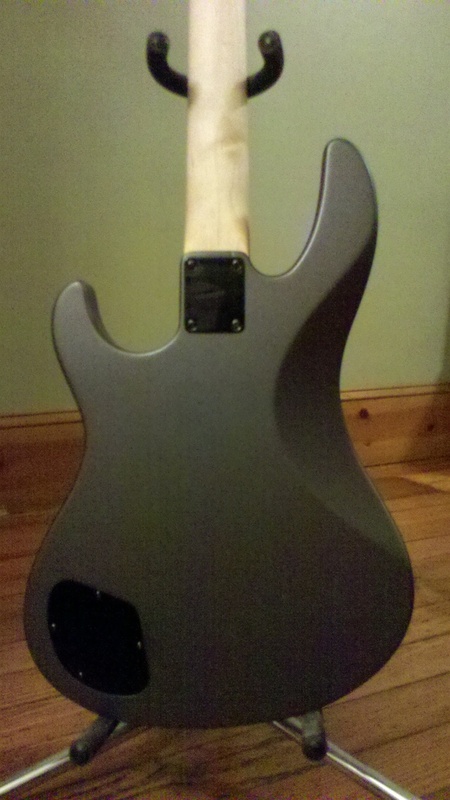 down side ..... i gotta put a doughnut hole in this bass; its a lot of routing. i'm open to anything anyone can tell me about any information or their experience with them. this m series has the truss rod bolt at the body. i dont know why manufacturers decide to put it at the body or the headstock ... whats the diff? i'm sure billy told yamaha to put the truss bolt at the headstock on his bass so iddid fit the model one at the neck position ... mine, it wont. bump both pickups towards the bridge. possible, because the middle p pickup is surrounded by pickguard. i can rout the cavity further back and cut the new pickguard accordingly. if i just move the model one back, both pickups will only be 1/4" away from each other ... magnetic field problems galore! find another narrower woofer humbucker soapbar pickup. looking at rio grande pitbull (not long enuff but it would get me there), emg hz, schaller humbucker (cool ... but tuff to get in the usa), lace alumitone (iffey about these), dimarzio x2n-b (tuff to get, discontinued) etc. a pickup < 1.8" would do it. 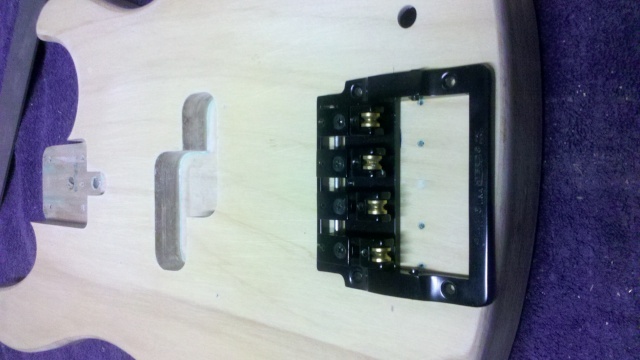 depending on what i find will dictate what pickup (and electronics) i put in the split p middle spot. ............ any suggestions or information? depending on what the specs are, i wonder if i could just go with a complete emg or some other active system. a lot of owners of the ltd's have talked about pickup imbalance and level cut in mono mode even to the point where some say, "i dont even use the woofer model one." (i experienced that with the warmoth p bass) .... so whats the point? fyi ... the warmoth p bass pickup cut in blend problems. solution? wired it jazz style with two volumes with the pickup positives on the middle lugs of the pots .... works fine. i been experimenting with different pickups on this bass recently ... making this fit, making that fit .... i think i need a new body soon. if your selling it, does it matter? Throw a nice bridge on it and call it a day. Yeah ... been thinking about it. Can def find a better candidate for a trem. 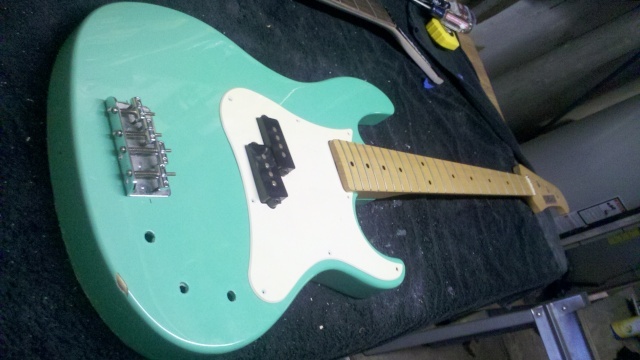 Def gonna do the pickups and mono / stereo wiring. We're making perogie pizza ... steelers are definately gonna win! finished this about an hour ago. i still need to do the setup including pickup height and intonation. its a relief that i am finally rid of that ugly turquoise blue. i know billy's is that color but .... yuk. but its got everything an attitude does now except for the scalloped frets. the pickups arent dimarzio, but have better magnets (alnico) and the same output (custom diesel). true stereo / mono wiring complete with the push pull on the middle volume and master tone. this thing plays exacly the same as the LTD.
new paint, aluminum metal flake gray. fender knockoff black recessed strat jack plates. dunlop strap locks (diddnt put them on yet in pic). I still find it weird that someone would want 2 cords and not a XLR jack or a stereo headphone for the 2 channels, but compared to that light green, it loos a lot nicer now. my understanding of the ltd production model is that is what the intention is, you can run stereo or mono (and thats the wiring schem i followed) but the dimarzio model one and will power pickups are so bassey low end that most people who have the ltd's never use the front pickup at all unless they are running stereo with the front pickup going to something rediculious like a 2X15 or 2X18 sub cabinet. my rewound deisel (rewound by a guitarerer friend of mine) has more mids, so the usefulness of it is a bit more realistic ... but still has a lot of low end just because of the bass neck position sweet spot. and CRUD! i thought i had strplocks for this! Honestly MadMike, if that bass had a trem....and more to the point....if I had $550, I would snap up that bass in a split second! It is gorgeous! the finish isnt perfect but i got like 95% of the dents, dings and belt rash out. did you see the big ding i missed right behind the p pickup? i'm embarrassed. i wanted to put a trem on instead of the hipshot extender (because i prefer on over the other and a trem makes it more marketable) but the kahler i had didnt fit (i needed like another .25"!) and the hipshot trems are just so darn expensive ... not to mention all the routing. maybe the next one. i know how to set up stereo / mono wiring now with DPDT pots now. if i see something that i'de think you'de like and can put a trem on, i'll get it, ask you and get to work on it. That turned out great. Nice work. Love the subtle color. I'm still waiting for you to build the bass in your avatar, BD! it's turn out cool indeed!! great job mike! !